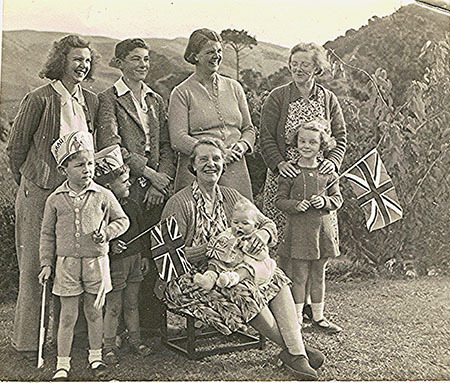 This is the story of the Fitt family, who came to live in Glenside in the late thirties. There were so many Fitt relatives living in Glenside, the locality was jokingly known as “Fittsville”. These memories are from David van Weede (b1929) who is a grandson of the patriarch of the family, Frank Herbert Fitt, known to David as ‘Pop’. David lived at Glenside from 1936 until 1946, when he was 16. This article is also available in PDF format here. This photograph was taken on on the front lawn of the Van Weede’s house at Glenside, looking up the valley towards Stebbings farm. It was taken after Victory over Japan Day in 1945. Back Row: Left to Right, Barbara Hassed nee Fitt , David Van Weede, Dorothy ( Doss) Wright nee Fitt and Margery Van Weede nee Fitt. Front Row: Alan Wright, Lloyd Hassed, Ethal Mary Fitt holding baby and Derely Van Weede. David van Weede: “This looks like my father in the photo, standing on the site of what was to be Frank Fitt’s house. Notice the power pole with the slight lean, this was to be the site of our home. In the background, are the macrocarpa’s sheltering the little farm cottage." 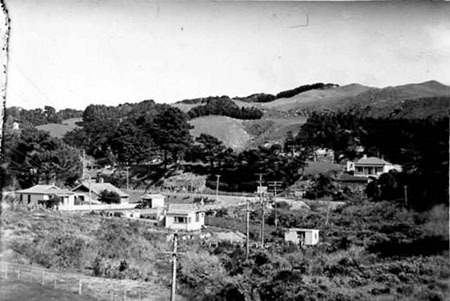 The farm cottage, hidden in the trees, was built by David Braid c1867 and still stands in situ, beside today’s Glenside-Churton Park motorway interchange. This photograph shows the intersection of present day Glenside road and Stebbings Road with the driveway beside the fence which currently leads down to vacant farmland. It was the site of the Glenugie homestead from 1886 until 1979, when it was pulled down. Houses from left to right: Far left, unknown. Second from left: This house was built and occupied by Bill and Addie McKeen. Bill's father Robert was the Speaker of the House of Parliament between 1947-1949. Third from left: The home of Margery and Walter van Weede, where they lived with David and his sister Derely (b1940). In the photogaph, the original van Weede cottage has now been modified and extended. Fourth from left: Frank and Ethel Fitt’s house with the two garages, "one for Pop and one for my father"said David. In front was a raised garden made of river-stone boulders uplifted from the creek behind the Glenside tennis courts. The road up to Frank and Ethel Fitt’s house was a new road developed by the families to service their new homes. In the future, this road would be modified slightly and become an extension of present day Glenside Road. Fifth from left: The home of Joseph Henry ‘Harry’ Wright and his wife Mabel Mary Wright. Les and Dorothy Wright's house, bottom right. The Wright's had a garden with round ponds, lilies and fish. Opposite their home, was a driveway that went up the hill to Narain’s house, which is where this photograph was taken from. 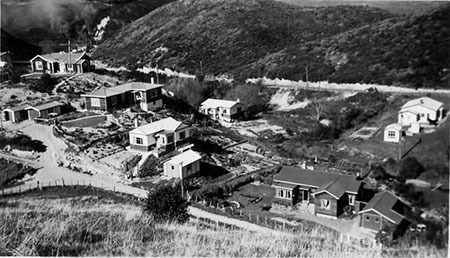 Behind Les and Dorothy’s house is Stan Juliff’s house, which was later the Savage’s house. Below where the photographer is standing at the bottom of the hill, on the corner, was a handcut bench into the hillside. This has since been identified as a pre 1900 house site, and is an archeological site. From the top: Homes of Marjorie and Walter van Weede, Frank and Ethel Fitt, ‘Harry’ and Mabel Wright. Taken from Narain's driveway. This view, if taken today, is looking south toward the intersection of Middleton Road [then Glenside Road] and Stebbings Road [now Glenside Road]. The bridge had recently replaced an old one. From left to right: The Hughes house, now the site of Twigland Gardeners World. Fanny and Harry Glass-Johnson’s house. Mr Glass-Johnson, an engineer, worked for Railways. The house was later removed for relocation. Another house was placed there and opened as a Herbs Café, now called Thyme Café. The house opposite the Hughes house is Budge and Sally Savage’s house, later occupied by their daughter Maryanne who was a nurse. “I think my parents had something to do with them moving to Glenside,” said David. “He was the local milkman in Linden. It had been Stan Juliff’s house prior to that. Stan Juliffe and his mother had relocated from the big two-story house [Woodlawn] which was now owned by Tulloch’s. "The Tulloch’s had some wonderful pictures inside their home of The Halfway House where horses were changed and some other interesting photographs of occasions in the grounds. The Tulloch's farm used to supply us with milk for some time until this was discontinued and we then went to the Taylor's farm,"said David. The Taylor’s farm is on the hillside and that is Bill Taylor’s house, with the front porch. He had a dairy farm. There was an advertising sign on the main road below the house which read 'Ladies wear Mann’s shoes'. 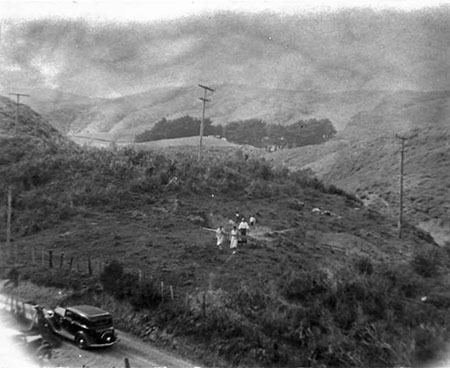 The McNair's house, which can’t be seen, was further up the main road toward Johnsonville, up on the hill behind the trees [now 219 Middleton Road]. "There was a sharp bend on the road going up to Johnsonville and over the years had a number of accidents," said David. "I remember when a big truck came down from Johnsonville and ploughed into a mob of sheep being moved on the road." As this story refers to a large number of the family, we shall start by getting orientated with the family genealogy. The patriarch of the family is Frank Herbert Fitt (1881-1960) who in 1906, married Ethel Mary Rooksbye (1884-1967). There are three daughters born to this family. Margery (b1902), Dorothy (b1909) and Barbara (b1917). David (b1929) is the son of Margery. The Fitt family came from Oxted in Surrey in the United Kingdom and moved to New Zealand in 1926. Frank’s background was electrical engineering. It is believed he achieved his Associate Member of Institution of Electrical Engineers (A.M.I.E.E) when working with the London City Council and his name is connected with the installation of lighting, likely outdoor flood lighting, at the Savoy Hotel. On arrival in New Zealand, the family made their home in Hataitai, close to Frank Fitt’s new job as the first manager of Philips Lamps in New Zealand. While there he did many outdoor lighting designs for various towns in New Zealand. Soon after arriving in New Zealand, in 1927, daughter Margery married Walter van Weede whom she had previously met in the UK. Their first-born child was David (b1929). Margery’s sister Dorothy, known as Doss, married Les Wright, a Technical Director at His Masters Voice, a recording studio and record pressing plant in Wellington. In 1938 this company also began manufacturing home appliances such as radios and refrigerators. David believes it was Les Wright who encouraged the Fitt family to move to Glenside. At the time, 1935, Les and Doss were living at Taita. The Public Works Camp at Glenside was emptying out as the new railway line was near completion and the men were heading off to other Public Works projects, such as the Homer Tunnel. 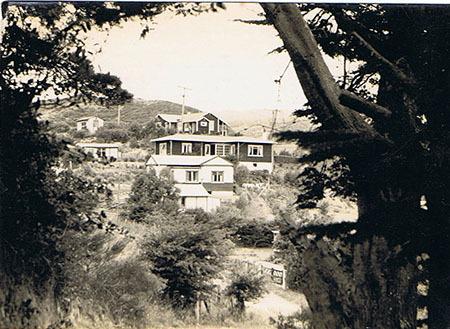 As Glenside was on the main road between Wellington and Porirua, the locality was an attractive proposition with a Post and Telegraph Office, a Tennis Court and a newly formed nine-hole Golf Club, which was to be opened in 1936. Furthermore, Glenside was in the country, surrounded by freshwater streams. It was an idyllic rural retreat. David was seven years old when his parents moved out to the house they had built for themselves on the sunny little hill surrounded by streams and richly covered with gorse and blackberry. “I slept in the glass porch and my parents slept in the main room which was lounge, dining room as well as a bedroom,” he said. "My Father joined the Wellington City Council as a traffic officer from about 1938 to 1943-44 so during most of my time in Glenside, he was a traffic officer." "When we were living at Glenside, I was educated at Johnsonville School. I used to walk there until I had the luxury of a bike. My last year was Standard 6, in 1943. I spent my secondary education at Wairarapa College. Most of the family attended church at St John’s Anglican Church, at the top of the hill in Johnsonville, from time to time." "Up the road (the drive) to the Halfway House, is where the Webbs lived. The house was divided into two in those days. One of the families, the Webbs, living in it were from Nuhaka, the father had a trucking business up there. Their eldest son Julian was my age and he had a younger brother Derek. Julian was to become one the Chief Engineers for the Union Steamship Company and was often on duty on the Wellington to Christchurch overnight ferry." "The Halfway House was on a hill slope down to a lawn and we used to play on that lawn and in the creek where we would catch eel and trout. There was a ranger by the name of Watt. Well, he was a ranger of sorts and he caught me and someone else with a sack that was obviously well loaded. "He said “What have you got there?” and I said “Watercress”. Well, he accosted us and said “Let’s see it,” and I tipped up the sack and the trout fell out! He said “Well, they must have jumped from the stream into your sack,” and he took them. Later that night he arrived at our back door with a fine trout for tea." "Up Stebbings Valley was a haunted house. Before you got to it, on the left hand side of the valley, there was a small ravine with bush. On the left-hand side of it where the paddocks sloped were these fields which produced heaps of mushrooms. I got up early one morning, picked the mushrooms and took a large basketful to the fruiterers shop in Johnsonville. This Fruit and Vege shop was on the west side just up from the Post Office, opposite the cinema. I got the princely sum of one and three-pence for them. I was rich!" "This viaduct used to support the main North-South railway line and for what seemed ages it was a challenge to be climbed every time I saw it. It was quite awesome with its badly deteriorated steel girders and to me an enormous height. It was steel and rusting furiously and as you climbed, great hunks of rust came off it. Of course the motorway lies right over this site. However I did climb it and unfortunately it was a windy day which didn't help much." "The small dam for the village water supply was located east of the viaduct above about a 30foot waterfall. This water supply was put in by the NZR to supply the work camp where the tunnel crews lived and after the camp was closed down the Railways kindly let the residents tap into the existing system, so most of the residents had running water. Occasionally the pipe system broke. When that happened, Mr Glass-Johnson collected all the necessary tools together, and together with the Glenside volunteers, would trek up at night with all the gear to repair the pipes. It was done at night because most people worked during the day. We used hurricane lights and torches to light up the area while a number of ladies made up sandwiches and tea to keep the team happy." "Every year the kids would build a dam to swim in Moxies Pond, which was in the Stebbings Stream about 300 metres below the Stebbings yards. One year we did such a good job that Len Stebbings came down to have a word to us – we had dammed too high and flooded his sheep yards!" "We used to go round the stream in Hodges farm [Glenugie] and pick out the old eggs that had gone rotten that the chooks had laid in the scrub and chuck them in the stream. It took about 5 minutes before all the eels arrived and you could be choosy which ones you wanted." "There is a great story about that tree. A school teacher and family were killed and buried there. It was also the site of a Maori track that came around the corner of the hill there. However the new road, the Westchester Link Road that was put in there in 2011, took out this land mark and during the construction no evidence came to light to support this story." "There were two creeks that came down into the main Stebbings creek. One was the Stebbings Creek itself, that flowed down the Stebbings Valley and the other was a smaller creek that fed into it. If you were walking up Stebbings Road toward the sheep yards this smaller creek would be on your left. There was a goldmine there and there was another one right on top of the ridge." "On June 24th, 1942 there was a severe earthquake shortly after 11 o’clock at night. At the time the Glenside people had got together to form Red Cross casualty classes. We met at the Hodges house in the evenings. There needed to be a patient and on this particular night I was elected. We did bandaging and started with the feet and I was bandaged all the way up to the top so that I couldn't move. When the earthquake came, a chimney in the house came down and everyone screamed and ran outside! They forgot about me!" "Where the road crosses over the entrance to the tunnel [Rowells Road] there used to be a big shed there which housed all the old electric mules used in the making of the tunnel and they were still there eight years after the completion of the tunnel. Mules are really a 'tractor' used in tunnelling/mining and normally are no higher than about a metre and are powered by electricity. They were used to pull the rail wagons full of diggings from the face of the tunnel for disposal 'outside' They ran on rails. This was a 'safe' system as it reduced the risk of fires and air pollution as well as noise." “During the war some of the men in our family served overseas. Ritchie Hassed, who was involved in explosives and blasted tunnels, joined the Army and was posted to various training camps to train new recruits. He eventually ended up with the Nobels Explosives Company of Scotland, which was part of Imperial Chemical Industries (ICI). Les Wright went up to Auckland University and used his radio technician skills to do ‘secret things’. "Pop was the Emergency Precautions Scheme (EPS) controller for the Glenide area and as such got a phone connection. To us, this was a miracle. To assist in the communication Pop located four of those old crank phones and promptly wired up the family houses with a single line. So when we got a 'two longs and a short' it would be for us, from someone in family. Pretty basic stuff, but it worked. He also got a 2 gallon can of petrol which was sealed and to be used for emergency purposes only." "I can recall so much about 'Pop' as for some reason we were fairly close. One of these was the trust he put in me, for example, when I was 14 he let me drive his car and trailer to collect river stones from the stream behind the old Glenside tennis courts for his garden. He was in some ways, a quiet man and highly respected." "The main road through Glenside must have been well made as it was the main north-south road and as such was the main link to the north. The American Marines arrived and established major camps at Pahatuanui and McKays Crossing. The road stood up to the huge influx of traffic which was non-stop 24/7 as they moved thousands of men and supplies to the camps and then in the reverse, leaving the camps when the push in the Pacific started." "When the war broke out it didn't take long for rationing to be introduced. Things like clothing, most of the basic food items and of course petrol came under rationing but the people of Glenside quickly adapted and vege plots grew larger and sharing with neighbours was common." "The first to leave of our family group I think, was Harry Wright, who went to live in South Africa. I am not too sure as to why he went there. Then Les and Dorothy Wright moved to Newlands. 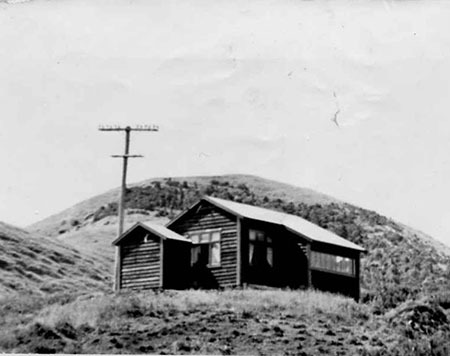 Pop went next, to a house at the top of the main road near Johnsonville and my parents went to Island Bay. Ritchie and Barbara Hassed moved much later to Johnsonville. The reason for the moves were age, getting a bigger home, and for my father, it was a health issue. He had completed a 26 week carpentry course in Mirimar. This was a great initiative by the Government of the time. They knew that when all the soldiers eventually returned from overseas they would need jobs so they created this crash course, a 26 week course to teach trades for carpenters, electricians, painters, plumbers and brick layers. 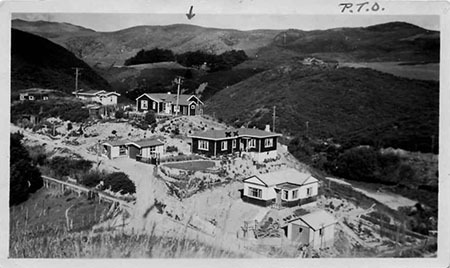 Due to his health, Dad had to give up carpentry so he bought a dairy/grocery at Island Bay and we went to live there. We left Glenside in 1946 soon after I came out of Wairarapa College." "Glenside was in those 'growing up' days a great place to live. It offered wide open areas and unlimited places to explore which was always a challenge to me. The people of Glenside were the heart of the district and adapted in many ways during the war years to the changes that came along. I hope future generations will keep Glenside as 'Glenside'."